I never posted last month with September’s books and since other projects (cough: building a website and starting a podcast: cough, cough) have caused my reading to take a hit, I’ll share the last two months reading here in one. My reading has been all over the place and as I look at this list I’m realizing that there are quite a few books I’d categorize as “in progress"-more than usual. Hopefully I’ll finish them all this month. As always, I’m linking up with Modern Mrs. Darcy’s Quick Lit posts to share the new and the notable! 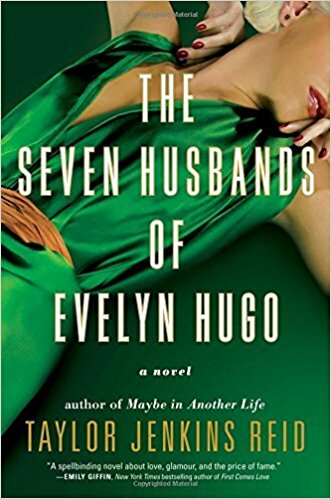 The Seven Husbands of Evelyn Hugo falls in the easy/fast category. It’s an easy book to get into, a fast read and one that, while it may not have been life changing, was thoroughly enjoyable. It’s the story of Evelyn Hugo, as told through her seven infamous marriages. Much of it takes place in Old Hollywood when studios could arrange marriages and the truth was much easier to hide. I thought the characters were interesting, I loved the peak into that era of film making, and while the big “twist” at the end didn’t do as much for me as the rest of the story, all in all, I’d recommend this for anyone looking for a pure enjoyment read. Little Fires Everywhere was awesome. I read it almost in one sitting on a plane. I loved the characters and didn’t want to leave them when it was done. It was interesting, thought-provoking and, for me, lived up to the hype. It’s a story about family, about feeling out of place, about young love and about art. I don’t want to reveal too much of the plot because I went in kind of blind and felt like it enhanced my experience. Suffice to say, it was a winner with me. Crazy Rich Asians (and the follow-up novel, China Rich Girlfriend) is a pure pleasure read. These are two of a trilogy series (I’m currently in the middle of the third) that follows members of the uber rich Asian class. The first one takes place mostly in Singapore, the second in mainland China. They’re funny, soap opera-ey and delightful. The author includes all these foot notes to explain Chinese phrases or dishes (the food descriptions are plentiful and amazing). I’m not uber rich, and I don’t really know much about the brands/commodities of the uber rich, so a lot of that went over my head, but it was a light read that kept me entertained. I’m excited to learn that it’s going to be a movie! I read A Wrinkle in Time as part of a challenge where I was to “read a book I’d already read.” Since the movie was coming out this year, I thought it might be fun to revisit those characters. I’m glad I did and after watching the trailer, I can’t wait for the film. The Royal We is a tale about a fictional British prince (who is strangely familiar to the real British prince) who falls in love with an American study abroad student. I’m embarrassed to admit how much I enjoyed it. It’s kinda campy and the influence of Will and Kate is blatant, but I flew through it. (And kinda hope there’s a sequel.) Technically Dinner: A Love Story is a cook book, but I read it like a memoir, carefully reading every page and dog earring almost half with recipes to try. Rosenstrach does a beautiful job weaving the story of how she made family dinner work from a young married woman, to a tired new mom, to a tired working mom, to a working mom with older kids and a bit more time on her hands. Her blog is wildly popular and I adored this, her first book. That’s what I got friends! Anything good you’ve been reading?